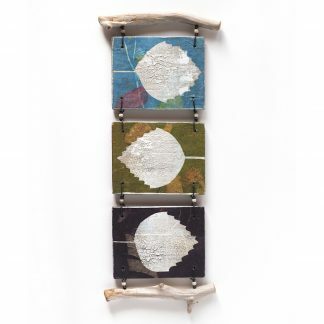 View cart “Mixed media wall hanging, three panels with textured leaves” has been added to your cart. This rustic mixed media wall hanging consists of three reclaimed plywood panels and pieces of driftwood, laced together with steel wire accented with cream colored glass beads. The panels feature highly textured abstract collages of leaves on backgrounds of blue, olive green and purple. Total height is 11″, total width is 4 1/2″ (28 cm x 11.4 cm).